Oh lord Jesus, I thank you for your infinite love and mercy upon my life. I thank you for counting me worthy of your kindness. You have shown me love and compassion despite all my wrongdoings and misgivings. I am grateful to you lord because you have never condemned me for any of my transgressions. Oh Heavenly Father, a repentant heart is all that you require from us. A true and sincere confession is all it takes to come back to your wonderful graces and become anew. Luke 15:10 In the same way, I tell you, there is joy in the presence of the angels of God over one sinner who repents. Matthew 3:8 Do those things that will show that you have turned from your sins. Oh merciful and forgiving Father, I am truly sorry that I have not been a faithful child to you. I have not been an obedient child to you. Have mercy on me lord and wipe away this feeling of guilt and shame. Forgive me, Lord so that I can start afresh and build a new relationship with you. One without stain of sin and one where I can prove my repentance to you. Lord Jesus, I thank you for your forgiveness. I believe your word which has made me understand that you have come to call sinners. Today, I humbly admit that I have wronged you. I know that I am not perfect but with you by my side I can be a better person and I will have nothing to worry about. Have mercy on me lord. Purify me and accept my repentant heart. 2 Corinthians 7:9 Yet now I am happy, not because you were made sorry, but because your sorrow led you to repentance. For you became sorrowful as God intended and so were not harmed in any way by us. Oh Father, I also ask that you give me the strength to stay true to you always and never fall back to my old ways. Give me the strength needed to resist temptations and stay true to you. All these I ask in Jesus’ name. Amen and Amen. God, I am coming to you with an open heart & mind and I ask that you please forgive me for losing my way and getting on the wrong path, please forgive me for my addictions, please heal me from them and I honestly don’t completely understand what’s going on with me but this paini feel is crippling sometimes, I feel like I am surrounded by evil, I do not know who I can trust and I feel like a scared child, I’m having, please help me and send a miracle for me, my children and family as well as the rest of the world, God please heal this world and take away all the viloence and cruelty, please give me strength and understanding, cleanse me of me of these sins and send me help to get me out of this scary situation I’ve been stuck in, thank you so much!! You are an obedient girl and that is glorifying to God who sent Jesus . Well written, thank you for sharing. I really needed this today. I appreciate your openness, faithfulness and the word that supports the truth You shared. I praise You my dear Heavenly Father.I honor You and give my life to You dear God, You are worthy of all my praise. Please Have Mercy on me Lord,Purify me and accept my repentant heart. I kneel before You today,in all honesty to say. I thank you dear God,for You always stay with me,walk beside me,there is nothing or no need to worry about,for You are my life,my way,my everything.Amen. 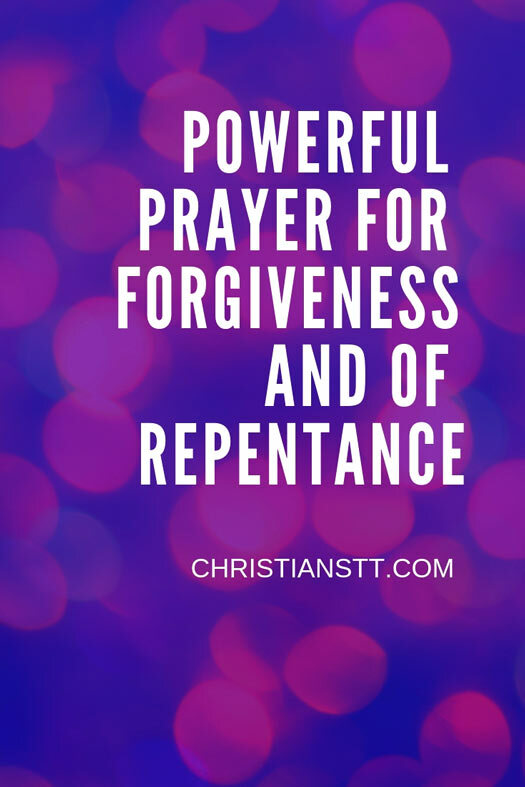 Thank you Lord Jesus,for Your forgivenness for us all.